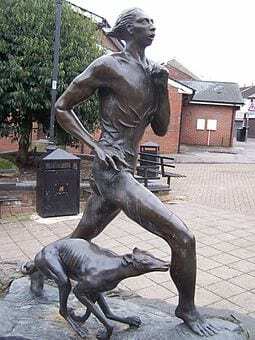 With the London Marathon over for another year, spare a thought for the man who is reputed to be the greatest runner in Wales. It is an intriguing story, but how much is true? 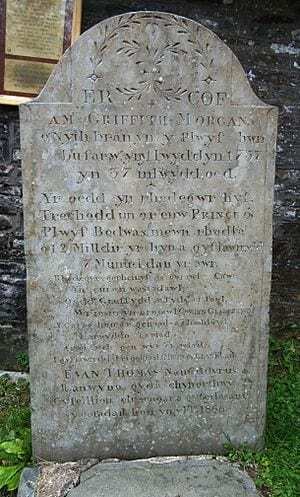 Griffith Morgan was born in 1700 at Llwyncelyn in an old farmhouse of Nyth Bran, the crows or raven’s nest, where his father ran a sheep farm. Hence he was given the nickname Guto Nyth Bran, Guto being short for Griffith. The original farmhouse stood on the slopes of Troedrhiwtrwyn near the Great Western Colliery in the Rhondda Valley. It has since been pulled down, and another built in its place, but the original barn still survives. Guto grew up to be an extremely fast runner and there are many tales about him – no doubt largely embroidered. One claimed that he slept in a dung heap to strength this legs, and another that he would often pace himself against the fastest hares and foxes. According to legend, if his mother sent him to Llantrisant or Aberdare on an errand, he would ask her to put the kettle on the fire for a cup of tea on his return. He would set off, cover the 12 miles, deliver his message and be back in the house before his mother had a chance to make the tea. One day his father told him to take the dog and bring the sheep down from the mountainside for shearing. ‘None at all,’ replied Guto,’ although one did give me a little trouble. That one there see?’ said Guto pointing at a strange looking reddish grey sheep. But I caught her in the end. Guto sometimes ran with the local Llanwynno hunt and he had no difficulty in keeping up over the moors and mountains with the hounds. He would catch the fox by its tail, long before the hounds came into sight. On one occasion he chased the fox all the way to Cardigan before eventually catching it. By now darkness was approaching and Guto and the hounds were too tired to make the journey back. A gentleman made Guto comfortable for the night and the following day he ran several races against the man’s horse, and won every time. Guto, being grateful for the man’s hospitality decided to repay him. He offered to race against the other man’s horse in the hope he could win back some of the man’s lost money. The race was arranged for the following day and Guto ran a magnificent race beating the horse by several yards. Guto was not the only winner, as the gentleman won back all the money he had lost and more. Guto’s fame spread throughout the Cynon Valley, and more races were arranged. Soon the runner needed a trainer and manager. Sian, the woman who kept the corner shop and Guto’s girlfriend, offered to help. She was fond of Guto, but also had a keen eye for business and could see herself making a fortune as a bookmaker. Sian made a substantial amount of money from Guto’s races, but, she was finding it increasingly difficult to find anyone willing to race against the champion, so he and Sian decided to retire to a quiet life before Guto turned thirty. Then during 1733, an English army captain from Hirwaun came forward and challenged Guto to a 4 mile race on Hirwaun Common, thinking he could easily win the £400 prize money easily. He felt he was younger and fitter than Guto. However the captain underestimated Guto, who was as fit as ever, and the captain was easily beaten. After this race people were in awe of him, but no more races were arranged. Then a man called Prince, affectionately known as the ‘Prince of Bedwas’ near Caerphilly came forward to race against Guto. 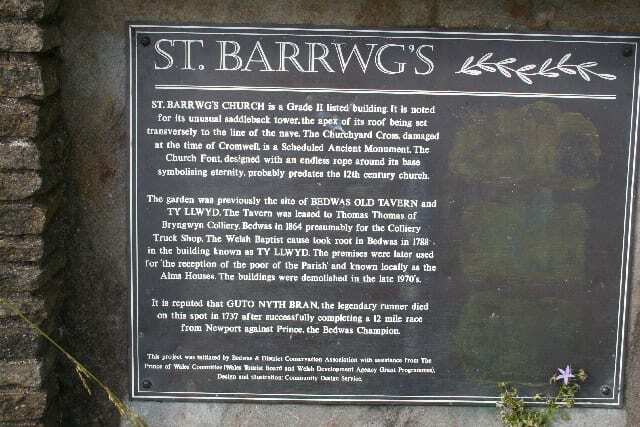 The race was set for 18 September and the route to be run was from Newport to Bedwas Church, a distance of some twelve miles. Guto was now thirty-seven years-old and was still a very agile man. The race attracted much publicity and hundreds of pounds were laid as bets were placed on both men. The prize money was 1000 guineas, equivalent to about £150,000 today. There was no public transport in those days, so Guto walked the thirty miles to the starting point with his friends and supporters. The two men left Newport together but Guto took his time and stopped on route to shake hands and talk to supporters, falling further and further behind. Suddenly he remembered all the money that had been wagered on him and he started to run in earnest. Soon he was gaining on Prince, but some of the opposition supporters spread glass on the road to slow him down. Undeterred, Guto leapt over the glass and ran on. 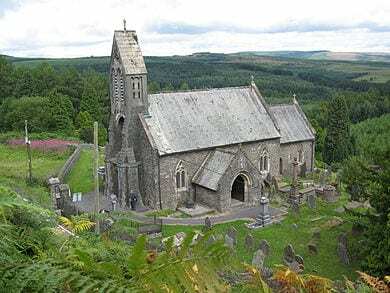 As he came to the steep slope leading to Bedwas church, he caught up with Prince and made a jibe about him running to slow to win the race. For a time both men ran together, then Guto surged forward and crossed the finishing line in fifty-three minutes. Sian was so excited that she ran up to Guto, slapped him on the back shouting, ‘Da iawn Guto Bach. Well done. Long live Guto Nyth Bran.’ Unfortunately, in the excitement, Sian forgot that he had run a hard race and his heart was beating faster because of his final efforts to win. To everyone’s horror Guto suddenly crumbled to the floor and died in Sian’s arms. The back slapping had proved too much for him and he died of a heart attack. Guto body was laid to rest in Llanwynno churchyard, and a gravestone was erected in 1866, over 100 years after his death. by the local Council. Bernard Baldwyn, former commonwealth GB athletics team manager started the Nos Galan races in 1958 to commemorate Guto achievements. Each year competitors from as far afield as Aberdeen in Scotland and Tulle in southern France take part in the races. A church service is held, and then a wreath is laid on Guto’s grave, in an endeavour to wake the spirit of the occupant to run with them. A mystery runner is chosen to light a flare which is carried to the nearby town of Mountain Ash, and these have included runners such as Lillian Board, Iwan Thomas, Linford Christie, and Welsh rugby International Shane Williams. Former Olympic, Commonwealth and World athlete Colin Jackson CBE was the 2015 Nos Galan mystery runner. Then, holding the flame aloft the mystery runner proceeds down the Mountain Ash road to start the race. There is no marked track, and the current route consists of three circuits of the town centre, starting in Henry Street and ending in Oxford Street, by the commemorative statute of Guto. It is a spectacular sight with townsfolk and visitors jostling behind barricades to catch a glimpse of the runners. Who Knows? Perhaps the ghost of Guto Nyth Bran runs alongside the mystery runner? Or does he rest besides his statue, silently observing the event? Traditionally the race was timed to end at midnight, but in recent years it was rescheduled for the convenience of families and now ends around 9pm. This has resulted in an increase of visitors to the town and starts with afternoon street entertainment, fun runs for the children, and concludes with a church service, the runners’ race and presentations.